Wireless keyboard is always a great gadget for users who like to lounge on the sofa while typing in rushing out a report. Sleek and ultra thin, the Japanese company Miyoshi has lately rolled out a new wireless keyboard at a pretty competitive and affordable price compared to other similar keyboards such as Logitech’s diNovo Edge which costs around $178. 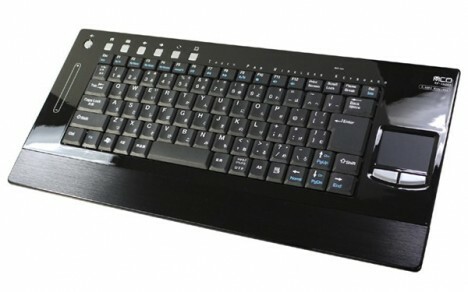 For a mere of ¥9,980 or just over $100, users can get this innovative wireless keyboard home. Weighing 850g (together with the battery) and measuring 190mm x 403mm x 26.2mm in dimension, the Miyoshi wireless keyboard (coded TP-24G01) is integrated with a small touchpad with two mouse buttons. The touchpad is located on the right hand side of the keyboard for users’ easy controlling. The TP-24G01 comes along with all the usual media-specific hotkeys for quick and easy access to applications such as web browser, media player, email, etc. The Miyoshi wireless keyboard TP-24G01 ensures seamless and secure operation from up to 10m range via its 2.4GHZ wireless capability. With this unique keyboard, users can enjoy ultimate flexibility and freedom when finishing their reports.